brings all this together in one system with full control over security, data access, content and design. The purpose is to give end users a simple link that they can click to get data delivered to them, drawn from wherever it exists, inside or outside of their organisation. Data can be gathered from anywhere you can connect to. 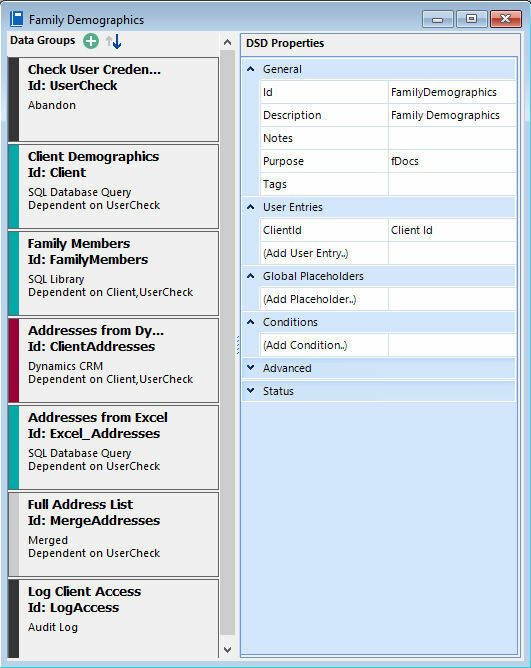 In many cases this is done using simple SQL queries, but we also provide data connectors for various applications such as Microsoft Dynamics® CRM, SharePoint, InfoShare ClearCore. In fact, if you have an application you’d like to gather data from and it includes an API or web service, talk to us about setting up a connector for it (it’s usually much simpler than you would think). Setting up the data gathering process is completely separate from defining the outputs, so even though it is a non-technical exercise, different people with different skills and focus can do the separate tasks, if that suits your organisation. Once you’ve created a data gathering setup (we call it a DSD – Data Set Definition) you can use it to define fPanels presentations, fDocs documents and fRemote sharing. When a user requests a presentation or document, the DSD is actioned to gather the data they need (e.g. for a specific client). fData gathers all of the data together, carrying out security checks that you have specified and recording any audits you requested. 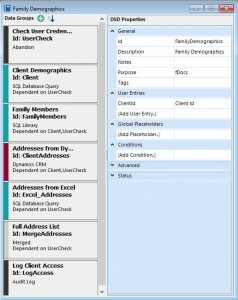 The set of data is then passed to fPanels or fDocs to generate the output. This is all done in memory on the server so no data is stored outside of the original sources. If the data includes information from another fSeries server, shared using fRemote, the requester server passes the request to the provider server which checks that you are allowed to request data, then checks that you are allowed the specific data you are requesting. If all tests are passed, the data is returned and is used as part of the overall set of data in the generated output. It’s worth noting that with fRemote, no matter what data is requested it is entirely in the control of the provider as to whether it is returned. To assist in deploying fPanels presentations and fDocs documents within your own applications fSeries Menu Builder lets you create structured menus and viewers to guide and direct your users to the information they need. To the user, they simply click on a link and a presentation or document is delivered to them containing data from wherever it needs to be gathered, even other organisations, in one easy to use place.